Addemar Support Knowledge - How do I launch my campaign? I have finalized my marketing campaign and I want to send to my selected contacts. A campaign is any combination of one or more launched emails and/or landing pages, sms, direct mail. In a campaign, you can define for each message when and to whom it is launched. A campaign can be defined over time (weekly newsletter), or regard just a one shot action ( an e-mail for an inquiry followed by a thank you e-mail ). Campaigns are launched through the launch wizard which is accessible on most pages in the top right corner of the application screen. Once launched, you can follow the results of your campaigns in the Evaluate section. 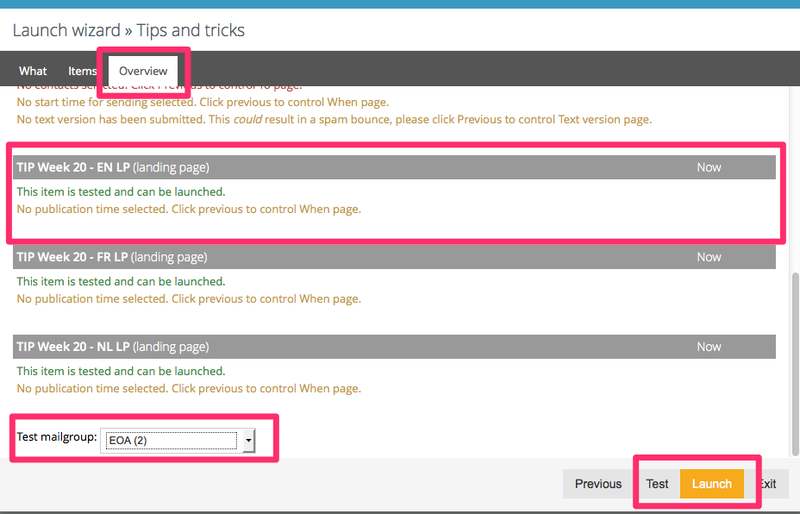 Open the Create, Launch or Evaluate section and click the button at the right side of the screen. Launch a new campaign : Fill in a name for a campaign and click Start. A new campaign is created. 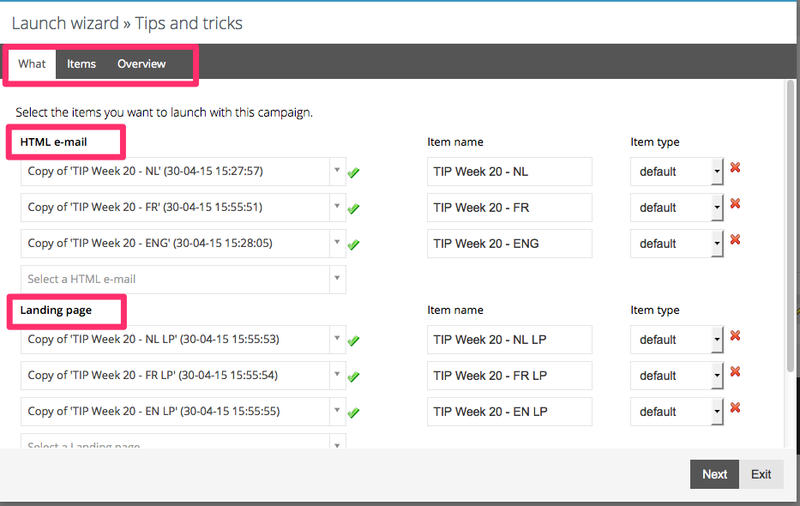 Continue launching a campaign : this option is used to continue where you left the launch wizard. Choose a campaign and click Start. Only draft campaigns can be continued. 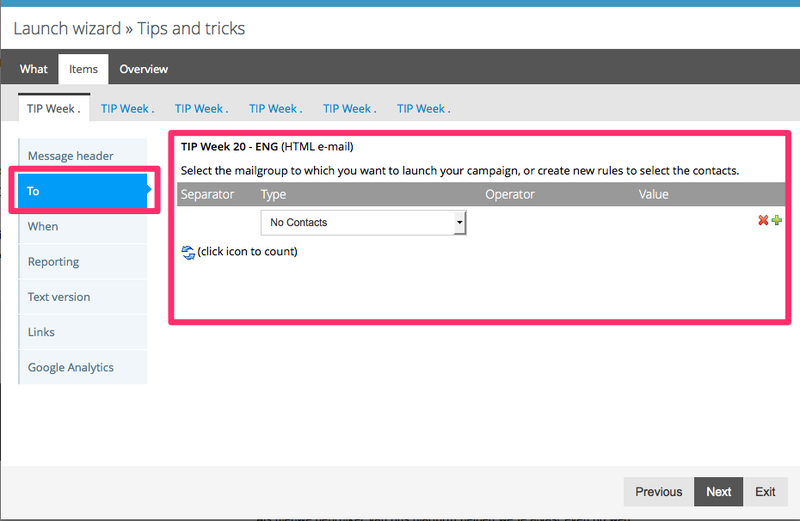 Launch new items in campaign : this option is used to add emails or landing pages to an existing campaign. Launch an e-mail or a landing page without a campaign : this option is used to send emails you want to follow-up individually and put online landing pages as a mini-site, independently from a campaign. Click Start to start the launch wizard. Select the items you want to send in the e-mail and/or landing page, SMS , Direct mail lists. Each ITEM you selected appears on a tab. For each e-mail, you will now define how, to whom and when it should be send. 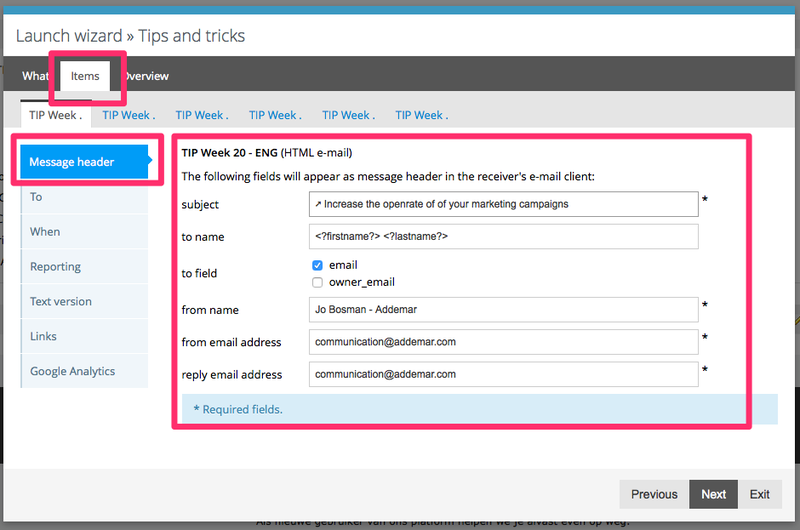 This page contains the e-mail fields which will appear in the receiver's e-mail client. To name : By default, the e-mail address of the receiver will be shown. You can type here a fixed expression, such as "to all habitants of Hasselt", or use an expression with a field code to personalize, such as "to the entire <?company?> team". From e-mail address : From address displayed next to the from name (or instead of the from name). This is a required field. Reply e-mail address : Reply address to which receivers of your e-mail can reply. Only manual replies and out of office replies are sent to this address, system errors are sent to the Addemar domain. The next step is defining TO WHOM you campaign will be sent ! In this page you define to whom the item should be send. Select one contact group from the list, combine two contact groups using the OR separator, or make a complex selection using the rules editor. Check this document to see what segmentation options you have in our platform. In the WHEN step, you define when the e-mail should be send. If you do not fill in a start time, sending will start as soon as possible. If you do not select an end time, sending will be finished as soon as possible. 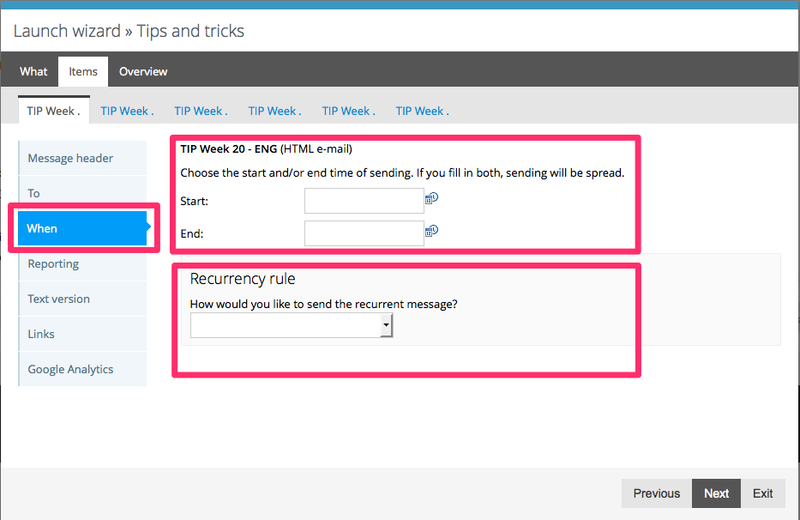 If you fill in both start and end time, sending will be spread between the defined start and end time. Text version : When the receiver's e-mail client does not support HTML, a text version of the e-mail will be shown. You can only select a text version if you have created one before. Reporting : In this page you define if and to whom reports about this e-mail or landing page should be sent. The drop down list contains all reporting lists that you defined in the contact groups section. If you do not want reports to be sent, choose no contact group. You see all items, the number of contacts selected for sending, and the scheduled time of sending. If something has been wrong defined in the previous steps, you will find an error (red) or warning (orange) here. Click Previous to correct the errors. You are obliged to launch a test first. Choose to which test list you want to send your test mail and click Test. The campaign will be sent to the test list you selected. The Evaluate section opens up, where you can follow the results of your test. The status of the tested items in your campaign is draft (testing). Check the messages that have been sent for test. It is important to test in different e-mail clients. You can test the landing pages via the link 'online for test'. If the test has been successful, you can launch the campaign.